Report the correct planting date. Include corners with the irrigated unit (not Recommended). In case of a loss or probable loss to your crops and/or if replanting crops insured under your crop insurance policy, you must notify your crop insurance specialist. 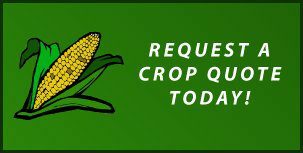 Prevented planted claims must be submitted within 72 hours of the end of the late plante period for that crop and can’t be submitted until after the final plant date for the crop. In a no loss situation, if you chop less than 50%, you can convert the remaining yield to grain on your APH for MPCI only. For CRC and RA, crops must be appraised or strips left to harvest or chop for silage (potential for revenue loss). Soft records include weight-wagon slips and yield monitors and can be used for APH purposes (but not for loss purposes). If bin measurements are used, call your crop insurance specialist for more information. If you have grain in a bin and plan on feeding the grain from the bin please call us to measure the bin or get with FSA to get a bin measurement of the grain before it is fed.